This one is ready to be donated. I'm just so happy with how this mishmash of orphan blocks and additions from my own stash all came together in the end. I absolutely love the quilting, feathers in the chevron areas, and dot to dot in the diamonds. On the sides I did a feather "flower" in each bottom corner and then arcs, using my trusty tool, a Bath & Bodyworks body butter container, to mark the arc. Then I FMQ-ed the arc, echoed it, filled it in with back and forth lines, and did the feathers on the outside. The dot to dot is ruler work and I only marked the inside point of one diamond, the turquoise one, on the first line. 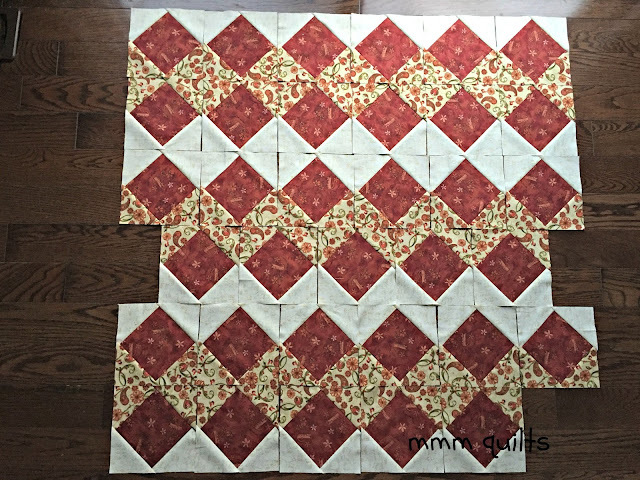 Angela says just go for it, and so I decided to take that risk on this quilt, and I am really surprised and pleased with how evenly they all turned out. :-) I had no problems with the tension with the Sulky rayon thread, but I did with the pale blue Fufus rayon, the same thread I used on wheelchair #5 quilt. I had few issues, if any on that one, so I am not sure what I am doing wrong, same bobbin thread. I ended up changing my needle from a 20 to a 14, with a better result. 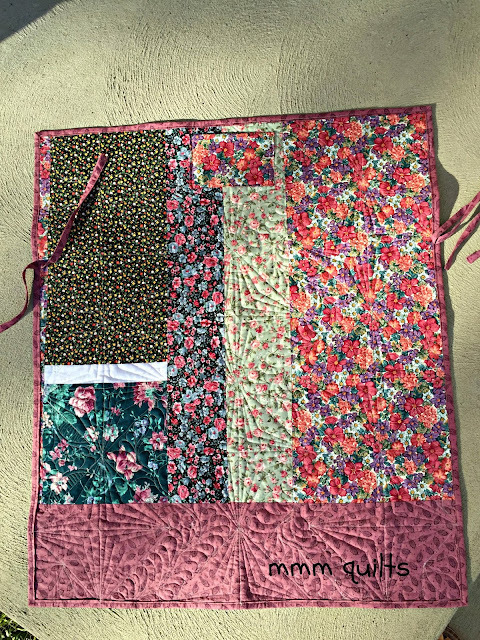 At first I worried that the back itself seemed to much of a mishmash, a dog's breakfast, but now that it is all quilted up and bound, I love it. I machine bound this one again, as these quilts need to be durable for much wear and tear and washing. It's so intriguing to imagine and speculate what these will grow into! 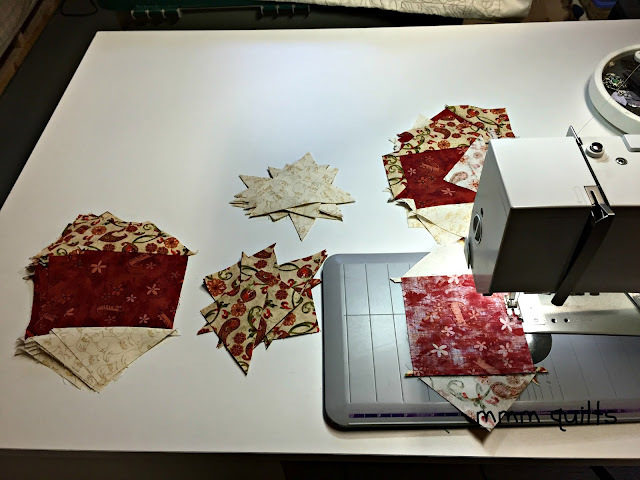 Here is a tip that probably everyone knows for adding the HSTs onto the squares in the September step. Sew with the square facing up so the bias edge is on the bottom. This will help to avoid stretching. If you use the little triangle-like dog ears as a guide, you can get pretty good alignment. I also finger-pressed the red square in half near the centre of the square so I could use that line as a reference for placement of the tip of the HST. 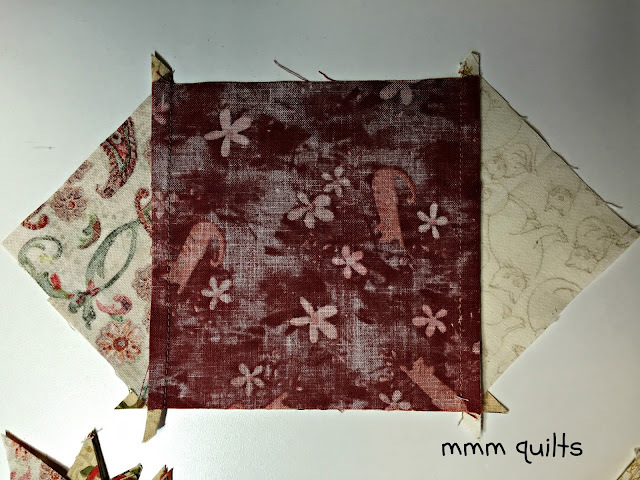 I hope it will end up okay, as I ran out of the taupe/ivory background, leftovers from my Indianapolis quilt (need to post on that one day, it's an older one), so I substituted the ivory cat fabric without knowing exactly where it would end up/how it will look. So there is one rectangle in the courthouse steps blocks of the cat fabric. It does jump a little, but it matches the cat fabric for the SiaS blocks, and I didn't think I should add in a third ivory-coloured fabric. Might have to ask Cheryl if she thinks this will be okay, or add in a third that is a bit closer to the taupe/ivory one. These are humongous 19" squares! There are 9 fanned out here. You can still get in on the mystery! Head to Cheryl's blog, Meadow Mist Designs for the deets. I'm linking this post up with Connie at Freemotion by the River. How awesome that you have made so many wheelchair quilts to donate. I also love how you used up orphan blocks to pull them together; no one would guess! Absolutely gorgeous quilting! I love the combination of feathers and dot to dot quilting. I also love your quilt stats. :) Good luck figuring out all those thread/needle/tension challenges. 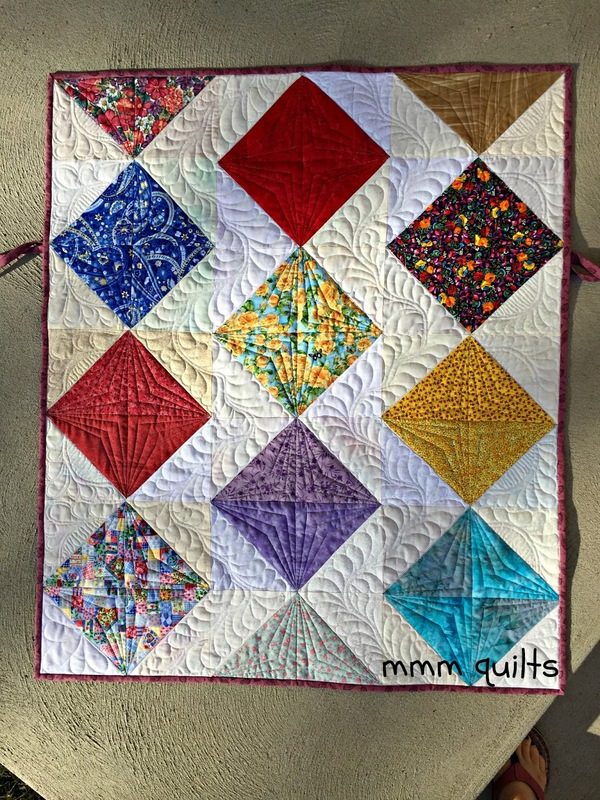 Your quilting on this one is absolutely stunning! So beautifully done :) I have been told that it is best to use the smallest needle possible when using really thin threads. . . I don't know if that translates to the long arm? Great quilting on the wheelchair quilt. Leave the blocks -- it will be part of the mystery. The wheelchair quilt is amazing. To think this gorgeous quilt was orphan blocks! What makes it so amazing is the quilting-your feathers are fantastic and the combination with the dot to dot works so well. Beautiful quilting! No one would guess that it started out as orphan blocks. 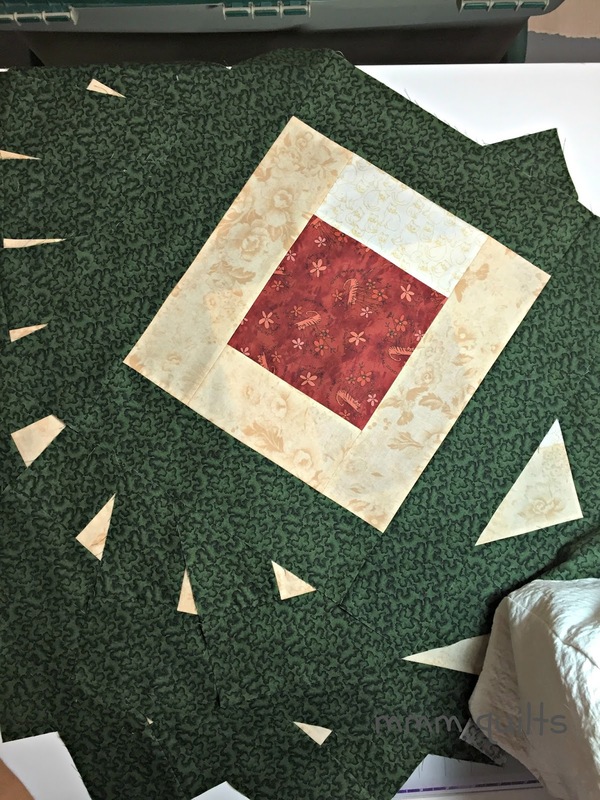 Your quilting on the wheel chair quilt is simply stunning! Your mystery blocks are looking great too! Waaaahh~I wannta be working on more donation quilts too!! 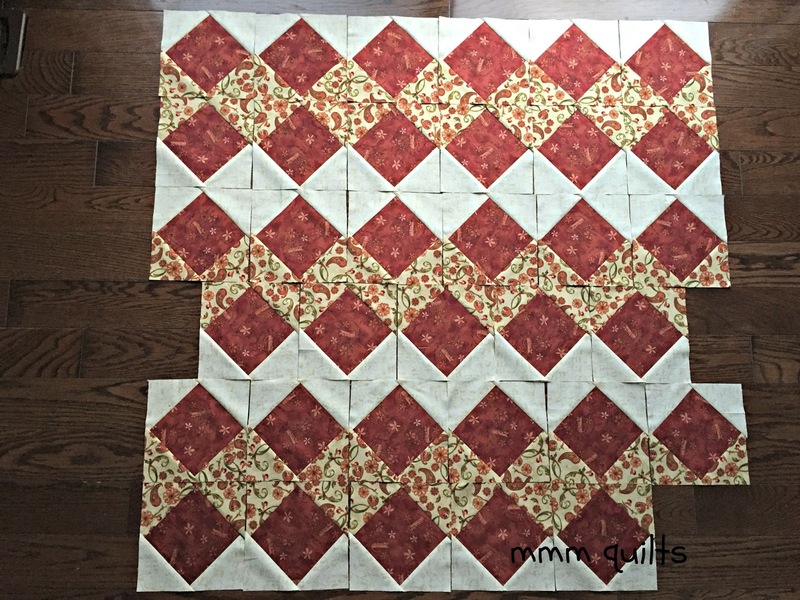 Your quilting is awesome on this! Nice quilt Sandra! Your quilting is gorgeous as always. I for one love the dog's breakfast backing and the way it plays with your quilting. Also, thanks for the tip about sewing with the bias edge on the bottom, so clever! Beautiful colours! Looks like a lot of work! "... a dog's breakfast" ??? What? Never in my life have I heard that! And my husband, a city boy, thinks I (a country girl) am the queen of odd little phrases and sayings. I love this one! My goal is to use it at least three times this week... and believe me, in my job as a teacher of 10 year olds and as a painter and in my house... I have plenty of opportunity to see, look at, find, and create "a dog's breakfast!" Ha ha ha... laughing at my new favorite phrase already! Creamsicle Wheelchair Quilt #10 and The Stack!